The Grand Canyon geology has fascinated mankind all throughout history. As a matter of fact, the Grand Canyon national park is considered to be a world-renowned and glorious showplace when it comes to geology. The first geological-based studies of the national park originated in the year of 1858, and have been ongoing to today. Not only is the exquisite display of beautifully layered rock considered to be exceptionally valuable in identifying the geologic history of the Colorado River region, the plateaus allow scientists to conduct comprehensive studies associated with the movements of the Earth. 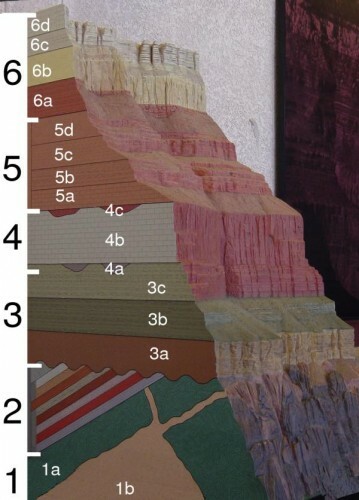 Additionally, the unique processes associated with the erosion of the streams of water and the subject of volcanism may also be studied by observing the Grand Canyon geology. Based on scientific studies, it has been established that many unique geological processes have occurred throughout history in order to create the panoramic views that may be observed today at the Grand Canyon. The single most powerful force associated with the national park is erosion. In most instances, this was caused by water; however, erosion by ice has also had a large impact on the geological formation of the park. Wind has also been identified as another force that has assisted in the shape and geological formations observed today. Furthermore, researchers have established that the flow of the Colorado River, continental drift, and various variations that have occurred within the orbit of the Earth have impacted theappearance of the Grand Canyon. Approximately 40 different rock layers are said to form the majestic and awe-inspiring walls of the Grand Canyon. The Grand Canyon is 277 miles in length and most of the layers of rock are visibly exposed, which makes it exceptionally easy to conduct comprehensive studies. A great deal of information may be obtained by observing the details that outline the changes of the national park through the layers that are currently present. Those that specialize in Grand Canyon geology have led the general public to understand that the area is not just some random area that does not matter. In fact, it is just the opposite. Today, as a result of the formations, rocks, paths, and structures that have formed, the Grand Canyon is considered to be one of the most beautiful and historically-significant locations on Earth. If you are mesmerized by the beauty and appeal associated with the Grand Canyon geology, you will be pleased to know that there are several unique opportunities to do just that! You may hike in and around the national park, take a helicopter tour for an aerial view of the distinct features of the park, or ride through the Grand Canyon on the Colorado River. In order to get the absolute best views, you should view the national park by air, land, and water! By getting up close and personal to the rock, the formations, the plateaus, and the sheer immensity of the canyon, you are sure to gain a newfound appreciation for the Grand Canyon geology that you witness.